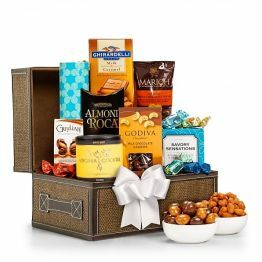 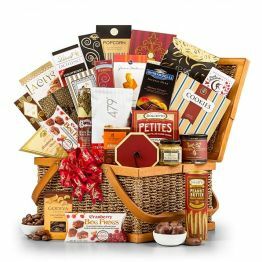 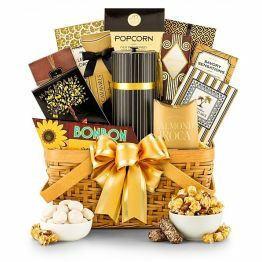 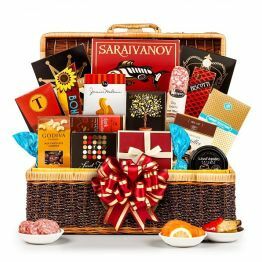 This hamper will earn you 152 Hamper Points. 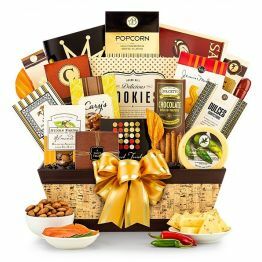 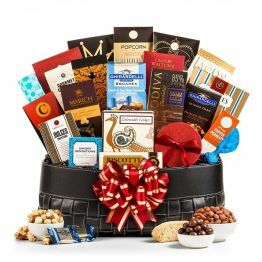 Jumbo Jalapeno Peanuts 4.9oz, Candy Berries 5oz, Saraivanov Smoked Salmon 4oz, Caramel Almond Popcorn 4oz, Cassil & Klein Biscotti 1.62oz, Aaron Bell Pretzels 4oz, European Cocoa 1.25oz, Macadams' Chocolate Chip Cookies 4oz, Aaron Bell Wasabi Peas 2oz, Parmesan Artichoke Cheese Biscuits 1.5oz, Hathaway's Peach Candies 5oz, Hathaway's Java Candy 1.8oz, Hathaway's Key Lime Cookies 5oz, Wine Companion Crackers 4oz, Gourmet Vanilla Caramels 2oz, Macadams' Island Mix 2oz, Auberge Brie Cheese Spread 3.75oz, Cheese Knife. 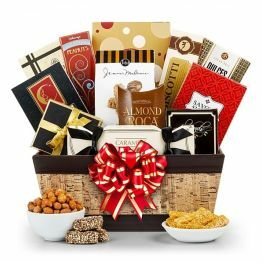 Presented in a Faux Cork Basket.